Reid is also popular with newer artists as a collaborator; the pairing of Shine, a French trip-hop act, and Reid led to him spending a week in Paris to record several tracks as guest vocalist. They played a one-off at the Pigalle Club in London on 26 August 2009. and Shine featuring Terry Reid was released as an EP in November 2009. More recently Reid has been in San Francisco lending his voice to the track "Listen" by DJ Shadow as one of a few bonus tracks added to on his best of album. Another collaboration has yet to see the light of day: "All God's Need Dancing Shoes" with Alabama 3. 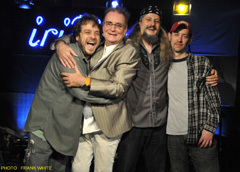 In addition to performing with Terry Reid, the Cosmic American Derelicts have opened for and played with many great artists including Mick Taylor, Max Middleton, Buddy Miles, Peter Jay, Tony Triscka, Jay Black, Levon Helm & Rick Danko, John Ginty, The Kentucky Headhunters, Derek Trucks, Vaser Clements, New Riders Of The Purple Sage, The Del McCoury Band and Peter Rowan … just to name a few.